Sara Holland grew up in small-town Minnesota among hundreds of books. 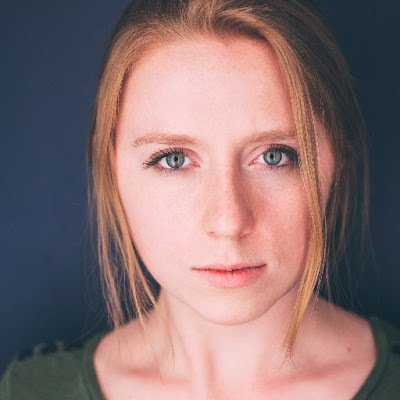 She graduated from Wesleyan University and worked in a tea shop, a dentist’s office, and a state capitol building before heading to New York to work in publishing. These days, she can be found exploring the city’s bookstores or finding new ways to put caffeine in her bloodstream. EVERMORE is the sequel to her New York Times-bestselling debut novel EVERLESS. It’s hard to pick just one thing… but I learned to critically look at a piece of writing, break it down, and revise it from the ground up, which has helped me since then on everything from college essays to massive novels. I was obsessed with STELLALUNA by Janell Cannon, a picture book about a young bat who’s separated from her mother, grows up in a family of birds, and is eventually reunited with the bats but stays friends with the birds. I’m not sure why; maybe it resonated with me as an introverted kid who always felt a little out of place? This probably isn’t new advice to anyone, but read, read, read! Read in all genres, but especially in the one you want to write. I think all books are part of one big, glorious conversation, and becoming familiar with that conversation will help you refine what you have to say. 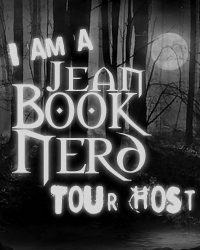 In your newest book, EVERMORE; can you tell my Book Nerd community a little about the novel? For sure, though it’s hard to do so without spoilers! The end of EVERLESS found Jules escaping from the Everless estate, alone and carrying a secret that upended everything she thought she knew about herself. In EVERMORE, she tries to learn about herself and her past in order to defeat a great enemy; but doing so might cost her everything she loves. What was one of the most surprising things you learned in creating Jules? Before Jules, I’d never tried to write a character who was grieving. I was worried her grief would make the story feel too heavy or monotonous or sad. But once I made sure to show her going after her goals despite—or even because of—her grief, it stopped being a weight on the narrative and instead propelled it along. For those who are unfamiliar with your series; EVERMORE, how would you introduce it? EVERLESS and EVERMORE take place in Sempera, a world where time is literally money—it can be bought and sold, meaning that the rich live for centuries while the poor trade their futures away just to stay alive in the now. In the midst of this world, seventeen-year-old Jules takes a job at the Downton Abbey-esque Everless estate to save her father, but discovers that Everless and the people in it are not always what they seem—and nor is Jules herself. Aside from Jules, which of your characters do you feel has grown the most since book one and in what way have they changed? Liam changes a lot over the course of EVERMORE especially. While his two driving forces—his love of learning and his love of Jules—stay constant, he has to learn to live with Jules the real person, not the idealized Jules he’s built up in his head. Which means learning to trust, give up control, and taking time to relax sometimes—a necessary skill, even with danger at their heels. Which character have you enjoyed getting to know the most over the course of writing EVERMORE Series? Ina Gold was super fun to write because she surprised me! At first, I’d envisioned her to be a sort of typical spoiled princess character, but in every scene she was in she somehow took on new dimensions of her own accord, becoming warm and funny and a great ray of light in an otherwise pretty dark book. Nothing official just yet, but I’d love to write a contemporary fantasy someday—something like my favorite books growing up, which made me believe magic could be just around the corner! My third-grade class had an overnight field trip at the local zoo, and the girls’ sleeping area was in front of the aquarium exhibit. It was so weird and cool to lay in my sleeping bag, beneath that weird, dim green light, and watch the tropical fish and sharks drift by all night. The all-day restaurant-bar-café near my apartment, where they have great drinks and don’t mind my hogging a table with my laptop when I don’t feel like writing at home! I usually plot out bits and pieces of whatever story I’m working on! It might be moving to New York after college with no savings and only a vague plan of working in book publishing… it worked out, but not without some trial and error. I had sort of a falling out with my friend group in high school right around graduation. Which sucked, and I spent a lot of time alone that summer, but I think it made me more willing, in college, to be more outgoing and seek out new experiences, because what did I have to lose? Thank you SARA HOLLAND for making this giveaway possible. 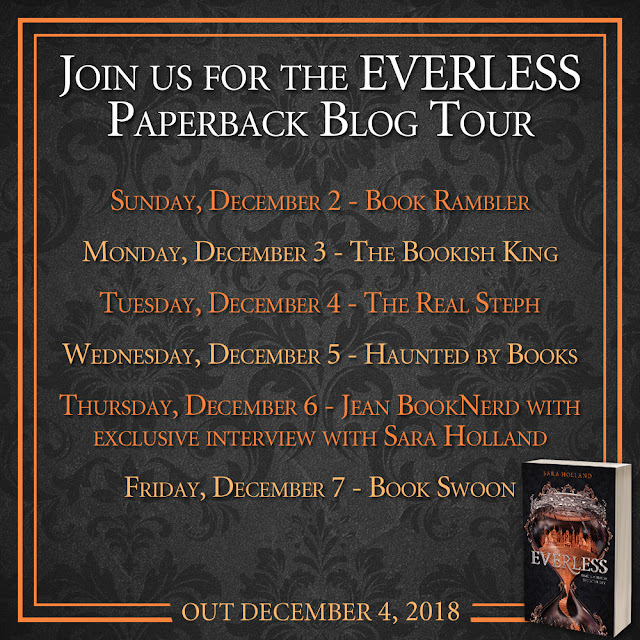 1 Winner will receive a Copy of Everless (Everless #1) by Sara Holland. My favorite sitcom growing up was Friends. "What was your favorite sitcom growing up?" "The Mary Tyler Moore Show." And now you know how old I am. "Friends"--pfft!! My favorite sitcom, among others, was Seinfeld. Aaach! You're making me date myself. My favorites were I Dream of Jeannie and Bewitched. I loved The Wild Wild West too!